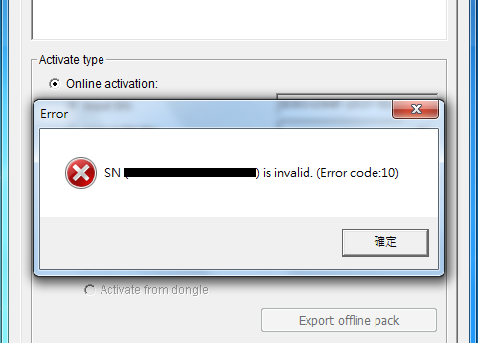 An error message "SN (a serial number) is invalid. (Error code: 10)" pops up, after clicking the "Activate Button" in License Management Tool. 1. The license is not found in our license server. 2. The license does not exist or there is a typo. Please note that the license is 4 set Hexadecimal number such as xxxx-xxxx-xxxx-xxxx. NOT the product SN (ex:NT-8040-AY0.XXXXXXXXX). You have to purchase product license from your region sales. 1. Kindly re-check your serial number again and/or type it properly. 2. If the issue still persists, please contact us at express@nuuo.com .